Self Defense training includes Chin Na / Grappling Skills training. Self Defense course includes Chin Na or Grappling skills. The most important skill in our Self Defense training is Chin Na technique, or sometimes refer to Qin Na literally means “catching-locking” in Chinese term , a technique used in Chinese Martial Arts. It is used to neutralize your opponent’s fighting ability by control or lock an opponent’s joint or muscle to put them out of action temporary. Chin Na features both standing and ground based grappling technique and it widely used for self-defense purpose. The origin of Chin Na can be dated back to Shaolin temple where it was used for self-defense without inflicting mortal injuries. Some says it is a compassionate way of response to an attack where it only temporary put your opponent out of action. It is a compassionate way of response to an attack where it only temporary put your opponent out of action. Enjoy Chin Na / Self defense training video in Kung Fu Republic. 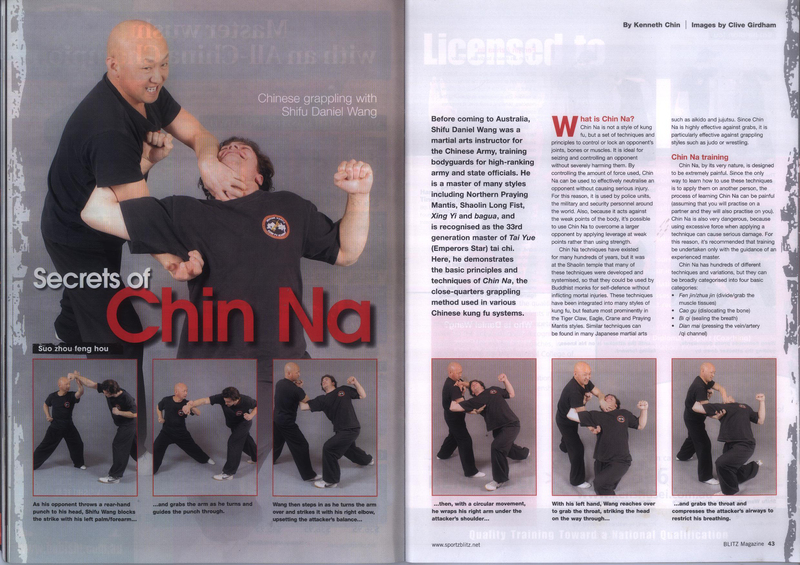 Chin Na is critical to self-defense. This system of close combat techniques comprising of traps, locks, holds and breaks. It focuses attacks against joints and 36 pressure points. It would not be surprised to find that most of the martial arts contain this technique in certain extent. Eagle Claw, Praying Mantis, Tiger Claw and Wing Chun are well known examples that focus on this advance technique. Besides, grappling based art such as Brazilian Jitsu, Akido and Jujutsu from Japan also got the influence from Chin Na. Fen Jin (dividing the muscle) – this technique tear apart opponent’s tendons of muscles. Cuo Gu (misplacing the bone) – refer to techniques which put the bones into wrong positions especially joints. Rou Dao (soft techniques) – generally use for training purposes. Although Sydney is one of the safest cities in the world, this course is particularly suitable for women for self-defense purpose. For that being said, it is always better to be prepared than sorry. In only five lessons, the student will learn to use about 20 to 30 techniques that they will be benefit from for a lifetime. If you are looking for self-defense course in Sydney, Kung Fu Republic will be a wise choice. Contact us now to book a seat in our class. Shifu Wang conducts Self Defense (Chin Na/Grappling) training once a week at our school, training time is 10:00am to 11:30am on Saturday.